I am soooo happy I stumbled across your blog, this is my first "visit." 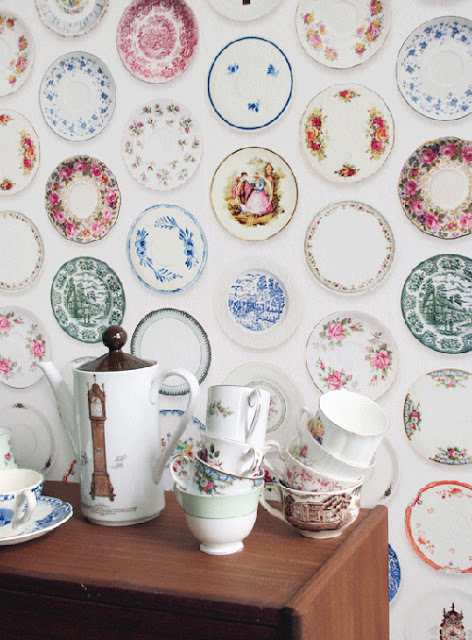 Oh my, what beautiful china and inspiring interiors. Well you are just having way too much fun Amy! That is going to look great - hope it comes soon! I'm sure it will be beautiful...can't wait to see it! When you bought the paper online, did you have to buy the whole roll? Very pretty wallpaper. You are a busy bee, aren't you? Can't wait to see how it turns out. Kat, I bought it as it came in a double roll on sale for $27! I could have bought more as there were ten rolls available. It is risky buying things like this online, so hopefully it will look as good as I imagine it to be. Your cabinet is going to be beautiful with that lovely wallpaper. Can't wait to see. Love the pattern on that wallpaper! 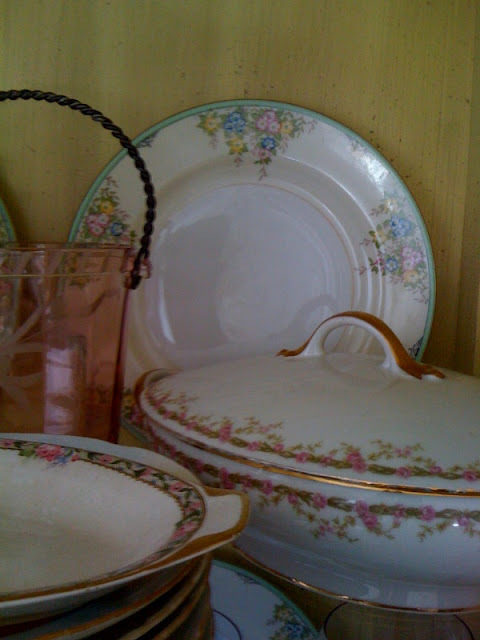 The roses are a perfect match to your china. Gonna be purty! LOVE the paper! Can't wait to see the cabinet. I't going to be lovely. It will be beautiful in your cabinet, Amy! Love the paper. That paper is exquisite! I love the serene blue background and the linear pattern of the print. With the larger pattern of the paper, your china, that is detailed and variable, will work beautifully. I wish I had your talent. Can't wait to see how it all looks. P.S. Love the birds in the wallpaper! Oh this is going to look gorgeous Amy! This is what I have been wanting to do to my cabinet for a long time. Right now I am going to paint it French blue. I have always thought about doing the chicken wire just like the above photo!! Can't wait to see yours when it is done!! I am so happy the pearls arrived safely...and that you like them!!! That wallpaper is gorgeous. This is exciting. What a great idea, it will look beautiful!! 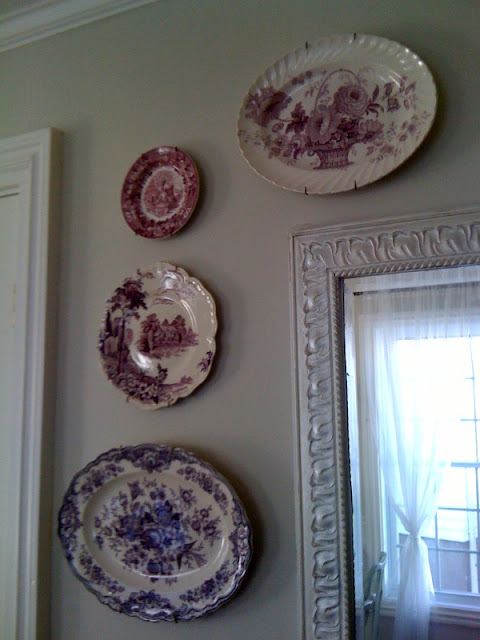 I thought those were real plates on the wall, not wallpaper!I have never heard birds were bad luck, good thing because I have been really into birds lately, especially fabric with birds! Your dishes are so gorgeous. You have one of my favorite patterns: Asiatic Pheasant. What a wonderful collection. I looked at that same wallpaper a year or so ago but in a different colored background. I think it is stunning! 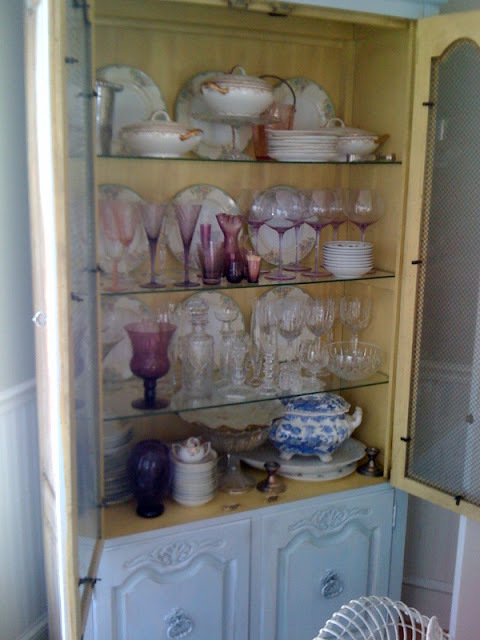 It is going to be so gorgeous in your cabinet and really make your dishes stand out. 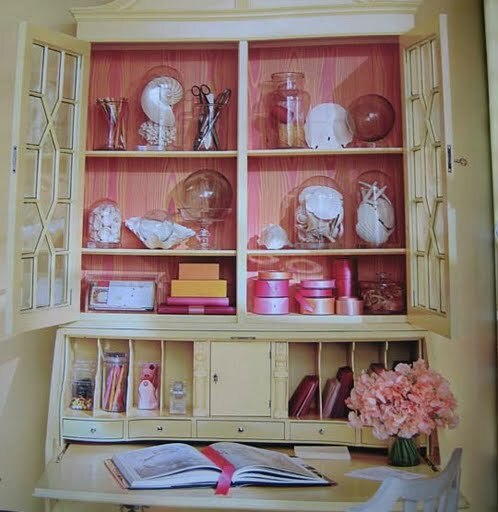 I think I might have to do this in my corner cabinets in my dining room. I just LOVE it! I cannot wait to see it all put together. The wallpaper is absolutely gorgeous and what a different way to use it. Your home is utterly breathtaking--my dream home! Your cabinet is really pretty right now so I bet it will look amazing once you add the new paper. Looking forward to seeing it! 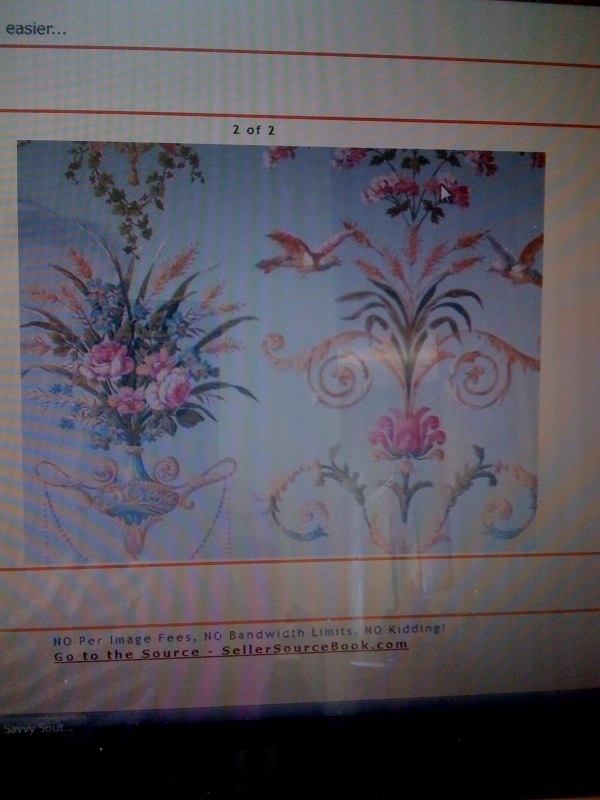 Your cabinet is going to look beautiful with that lovely new background, Amy... can't wait to see! Good morning! Just grabbed a cup of coffee and clicked on a link on someone's page and here I am! What a gorgeous blog. Love your style. I am excited to see how your project turns out. Hi - glad I found your blog. I have the same China cabinet - only mine was two of them pieced together - with a larger crown molding keeping the two together. I separated them (thank goodness the insides were finished) and now the two are in my dining room with antiqued mirror panels separating them (I'll have to post a picture). But I have been dying to paint them ever since I got them! 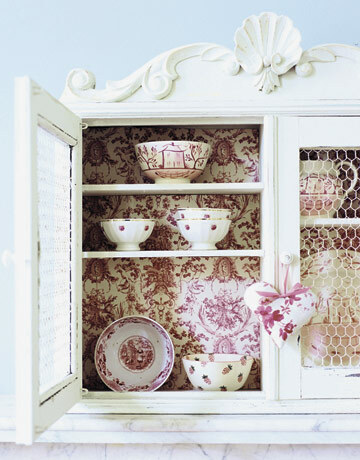 Love your wallpaper ideas for the back of the cabinets. Looks great!